If you look at this picture and grasp the totality of its meaning, then no one needs to say another thing. in their grief, than all of us. 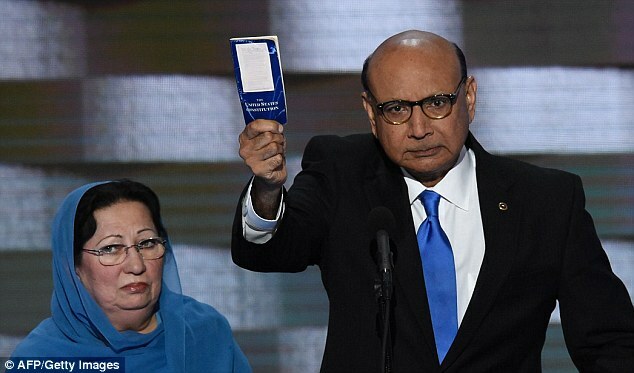 A father of a slain Muslim-American soldier, a hero by all accounts, told Donald Trump, “Let me ask you: Have you even read the U.S. Constitution? I will gladly lend you my copy." Then Donald Trump asked why the soldier's mother was silent, implying that maybe her religion forbade her from speaking, when only her overwhelming grief prevented her. In that moment we saw Trump's utter lack of empathy or understanding, the sheer absence of his humanity. Trump's instincts were to attack instead of soothe; to bellow instead grow quiet; to chatter away when he should be still, waiting to gain insight. He was so obviously empty of what he needed to be a leader in desperate times, or any times. In that moment, we as a nation didn't, shouldn't want him. He, Trump, should not be elevated, but shunned. He is not for us.